How do you make Split Pea Soup without hambone? Most of us prepare a whole (or half) ham once or twice a year at most, so ham bones are scarce. Does that mean we have to limit our consumption of Split Pea Soup — an exceptionally tasty and satisfying dish — to once or twice a year? Fortunately, no. Last year we discussed how to make Split Pea Soup with Bacon. That recipe uses bacon and ham base as a hambone substitute and it is relatively quick to prepare. But good as the flavor is, it lacks a certain oomph. If you want Split Pea Soup with traditional flavor— but without the traditional hambone — you’ll need to look for a “secret ingredient” in your supermarket meat department: smoked ham shanks or ham hocks. These inexpensive miniature “hambones” are the perfect size for soup making. Dark, leafy greens are nutritional wonders. Including them in dishes made with dried beans, legumes, and pulses is an easy and extremely tasty way to fold them into our diet. They also add a new and interesting dimension to this soup. But you can also make this dish without the greens (just skip them). More about that in the Notes. First, you need to make a stock with the ham shank. (This is a soup, so tasty stock is important.) Because you need at least an hour and a half to develop good flavor — and because split peas take only about 45 minutes to an hour to cook — you’ll need to start the stock, then add the split peas halfway through. Second, you need to sauté/braise the dark greens. Long-cooked greens can be delicious, but if you add them to the pot at the beginning of the recipe (which means letting them cook for 2 hours), they’ll turn into a dark gloopy mess. To retain their fresh, characteristic flavor, you should add them after you add the split peas to the soup — about an hour into the recipe. Depending on how thick you make the soup (how much water you add), this recipe makes about 4 quarts — enough to feed a crowd. Leftovers freeze well. This recipe takes about 2 hours total; active time is 20 to 30 minutes. Rinse ham shanks and place in large pot (see first Note). Add water, bring to simmer, and skim scum that will form. Simmer for one hour (this is to develop stock). At the hour mark (or a bit later; time isn’t critical), pick over split peas, rinse, and add to the stock. Now peel and dice your additional onion (I like ¼-inch dice, but anything up to ½-inch is fine); wash, peel, and dice your carrots; and wash, peel, and dice your celery. Peel and mince or slice your garlic (I like to slice because I enjoy biting into largish pieces; most people prefer minced). Wash greens. Cut out overly large/woody stems. Heat deep casserole or Dutch oven on medium burner (see first Note), and add oil. Immediately add diced onions, carrots, and celery; season with salt and pepper, and sauté until onions are translucent (about 5 minutes). Add dried thyme and optional pepper flakes; sauté for about 30 seconds (to flavor the oil); add greens. Stir greens to incorporate with onion mixture, sauté greens for a minute, then cover pot and reduce heat to medium-low. Braise for 5 minutes (10 minutes if you use a tougher green like collard greens). Meanwhile, skim the pot containing the ham shank and split peas to remove any scum. Remove ham shanks, let cool briefly, then remove meat from bone. Dice into bite-size pieces. After the greens have braised for 5 minutes (or longer, if you choose), it’s time to combine the split peas and the greens (see the first Note below for comments on which pot to use). Before you combine the two, remove and discard the halved onion that you added to the ham stock in Step 2. After you combine the split peas and greens, add the diced pieces of ham to the pot. Add more water if necessary to obtain the consistency you prefer, and adjust seasoning. Simmer for at least half an hour (up to an hour) until split peas are soft and cooked to the desired consistency (see Notes). If you want the soup to have a less chunky, more homogenized texture, you can use a stick blender at this point to blend it. (Be aware that if your stick blender has a plastic shaft, the hot liquid may crack it). Adjust seasoning one more time and serve. A Homemade Crouton garnish is a nice finishing touch. You will end up with about 4 quarts of soup, so you’ll need a pot big enough to hold this amount. I usually prepare the greens in a 6-quart Dutch oven, and then add the ham and split pea mixture (I use a ladle until the volume is reduced to the point that it’s easy to dump the rest of the split peas into the greens pot). So I can get away with a 4- or 5-quart pot for cooking the split peas. But you may find it’s easier to add the greens to the split peas. In that case, you’ll need to cook the ham stock and split peas in a pot that holds at least 6 quarts. The ham shank should give your broth a nice ham flavor. But if you want to up the flavor quotient, you could add a teaspoon or two of ham base (commercially prepared ham stock that’s been reduced to a paste). My favorite brand is “Better than Bouillon,” which many supermarkets carry (you can also order it from Amazon). I’ve heard great things about Minor’s Brand, though I haven’t used it. They sell primarily to restaurants and other commercial entities, but individuals can order through their website. 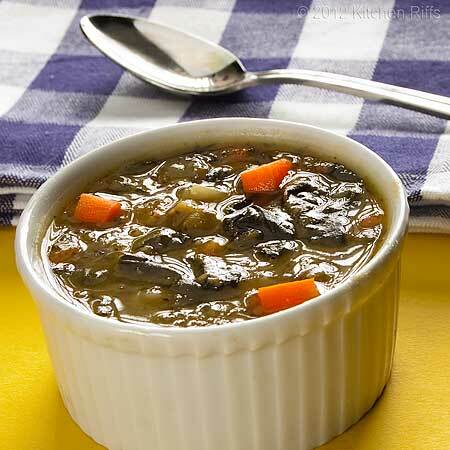 If you omit greens from this recipe, you’ll have a traditional Split Pea Soup. 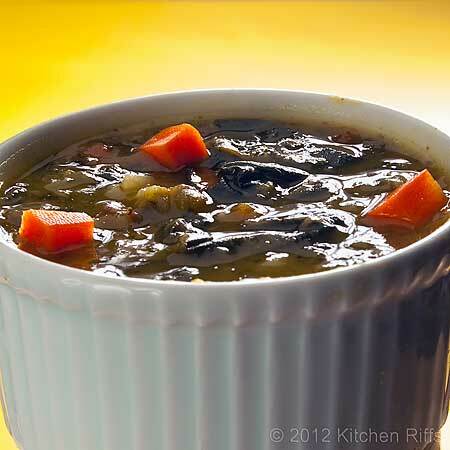 You’ll still want to sauté the onions, carrots, and celery and add them to the ham stock after you add the split peas. If you add them at the beginning of the process, by the end of two hours they’ll have lost much of their personality. But I urge you to at least try this soup with greens. Dark, leafy (and sometimes bitter) greens are chockfull of vitamins, minerals, antioxidants, and other good stuff. 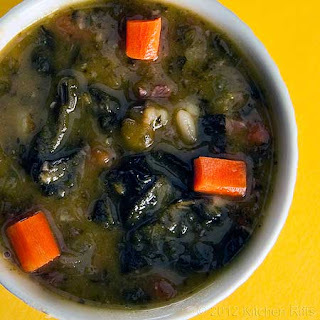 Adding greens to soups (particularly legume soups) is an easy, painless way to add them to your diet. Almost any dark, leafy green would probably go well in this soup. I particularly like Swiss chard. This is a staple of the Kitchen Riffs garden, and grows well until the weather turns quite cold (ours lasted into November this year; in fact, the soup in the pictures was made in November with homegrown Swiss chard). Other greens that work equally well: kale, spinach, collard greens, mustard greens, escarole. We call a lot of greens “bitter” because they have a somewhat pungent taste. But they’re bitter in a good way (chocolate and coffee also have a “bitter” taste). Want to know more about bitter greens? The blog A Veggie Venture has a nice introduction to them. A Homemade Crouton garnish is nice on this soup. If you decide to do this, you can make them while the soup simmers in Step 3. This is a great main course soup. It’s also great for informal parties — like a Super Bowl Party, or to bring to a pot luck dinner. Speaking of pot lucks, Kitchen Riffs contributes some recipes to gojee. Split Pea Soup with Greens is the dish that I’ll be bringing to the potluck they’re holding for their contributors later this week. Well, actually I’m bringing it virtually, since I’m in St. Louis and they’re in New York City. Starting on Thursday, January 26, check out other potluck dishes shared by fellow gojee contributors. Go to gojee.com and enter “gojeepotluck” into I Crave. You can also follow #gojeepotluck on Twitter. Yum, yum, yum ... I love split pea soup and your recipe now has me craving it! I'll definitely need to whip this up this winter! Hi Kimberly, great soup, isn't it? Sorry I've created that craving! Thanks for your comment. Hi Jay, it is pretty good. 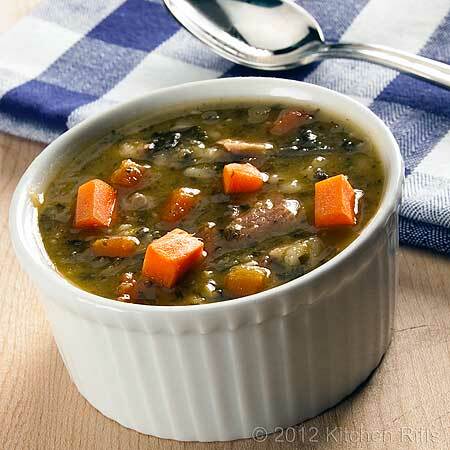 You don't normally think of adding greens to Split Pea Soup, but the combo really works. Thanks for stopping by. Mmm. Another scrumptious looking soup. I am definitely adding this to my winter soup list. Hi Russell, Split Pea Soup is great. I love its traditional flavor, and you're right - it's perfect for winter. Thanks for taking time to comment. This soup must have such depth of flavor - it sounds just delicious! I don't think I'll be able to find ham hocks here, but I can come by bacon. I'll have to check out that other recipe of yours. Hi Katherine, the flavor is terrific! But the bacon version is really good too (I haven't add greens to that, but I think they'd be wonderful in it). Thanks for stopping by. What a healthy soup. Filling and comforting!!! Hi Asmita, you're right that it's healthy and definitely filling. Really a nice soup. Thanks for commenting. What a delicious looking soup. I haven't had split peas anything in a while...I'm going to have to try this soon next time! Hi Simply Tia, thanks! Split peas are easy to forget about - but when you have them again you wonder why. They've got great flavor. Thanks for commenting. Ohh, just saw this soup. Definitely trying this one first! Yum! Hi Patty, this soup has wonderful flavor - I think you'll enjoy it. Thanks for stopping by. Hi make this soup all the time with bacon, ham, homemade ham stock, ham hocks etc. However I was wondering where you got your ham cubes or base because I like to keep them around, just in case. Also what is the brand name and any other info about the product you can give me. My source just ran out. Thank you in advance! By the way it's my favorite soup. Hi Anonymous, I usually buy my base at the supermarket. I like the Better than Bouillon brand, but over the last year or two I've seen some other brands carried at my supermarket (which I haven't tried). Pennzey's has a base that's pretty good. The second Note (above) lists some sources for soup base. Hope that helps, and thanks for stopping by. A shame I can't pin this, I can't understand why you wouldn't want the free publicity driving people to your website that Pintrest generates. Hi elocrian, I'm not sure why you can't pin this - I haven't put any restrictions on photos so people can't pin them. And I know others have pinned lots of my pictures. But thanks for the heads up - I'll investigate to see if there's some setting on the blog that's preventing pinning.